A few months ago I decided to give the Hyperstar another chance, sold my Hyperstar for Edge 8" and placed an order for another one for my Edge 11", it was on back order and when it shipped I found out I was getting the new Hyperstar 4. At first I bought the adapter to use with my existing filter tray accessory but soon found out I'd have to find another solution because not being able to fully automate is one of the reasons I gave up on my first Hyperstar but I had seen before here on CN where a few people mentioned using it with a filter wheel but I never thought this would give me perfect stars, until a friend on Facebook told me he was using it successfully and showed me an image. I was super excited about being able to run a Hyperstar and have my sleep too so I placed an order for a ZWO mini filter wheel and started my journey. Collimation of the Hyperstar can be a challenge, especially in the winter but I already had a Hotech advanced collimator so I only had to buy the adapter for the Hyperstar 11" and that was a tremendous help. I have been enjoying this thing a lot, sometimes I can capture 2 full targets in one night where before it would take me days shooting at F/7 so challenges apart, I am very pleased. Please see my latest image, I hope you enjoy it! So you don't need no mask for it ? I have a 3D-printed cable router for the cables and a circular mask to cover the corners of the filter wheel. There's a picture of it on my Astrobin. Surprisingly, it doesn't really take a whole lot more than the diameter of the Hyperstar itself. The angle of my image on astrobin looks like it takes the whole side of the corrector plate but that's just an illusion. The ZWO mini FW is very small. Unfortunately I don't think this would work on an 8" since this OTA is much smaller than the 11" . How much extra obstruction do you get? Nice image, Sam. A filter wheel on a C11 Hyperstar! Neat trick, and it looks like a good match for the 694 chip's small pixels. How do you do flats? Oh it looks like the rectangular part of the filter wheel will protrude into the light path, right !? Much less than i thought. Nice! Thank you! I am using it with my Atik 460 ex, I like the pixel size a little larger, especially now on galaxy season. I do own an ASI 1600 which I also plan to use with this setup in the future. For flats all I do is to keep the dew shield permanently attached, point the scope up and place the flats panel on top of the shield. My ZWO 8-position and my Atik FW2 also extremely large compared with the mini. 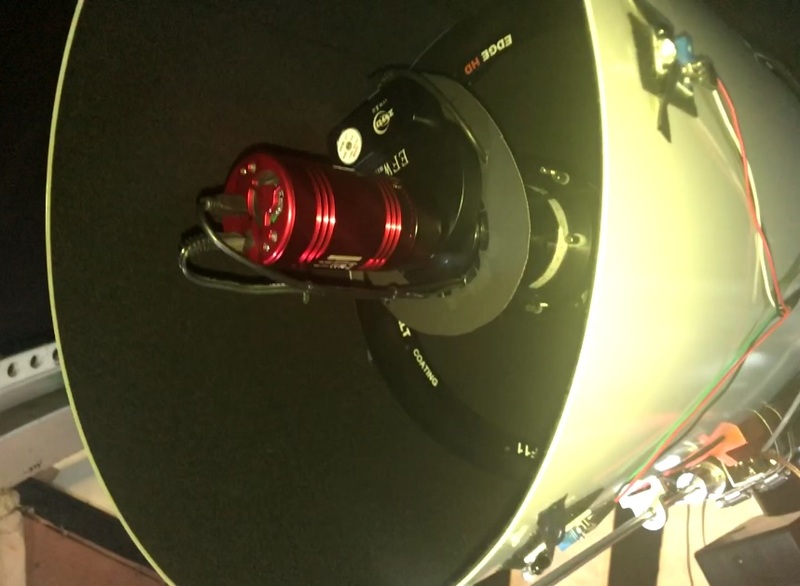 The Hyperstar V4 has excellent off axis correction and your collimation must be spot on! Very nice image, good work!! Nice image Sam. Looking good. Great details. I've been really happy with the results. I use a Python script to automate the full LRGB sequences so an auto FW was important. I also built and automated flat panel so the entire process is push button. Still working out a few bugs but I'm 99% there. Looks really good nice fine details in the arms and core. I'm surprised a filter wheel is working out for you it must be the mini ZWO that keeps obstruction to a minimum. I have been using a 3D printed cable router with my two setups for a while now they work great. I contacted your source and I helped him design a 14" version based off my OTAs measurements with digital calipers. You can see it installed and functioning in this YouTube video I created about Hyperstar C14 use. I prefer the manual method myself I do everything unguided with the AP1100 and a very basic camera control with Nebulosity. Since I always have to setup remotely It's redundant for me to automate any tasks. I'm still contemplating upgrading my 8" Hyperstar to v4 but it's really a secondary system for me. The 14" version is already at v4 specs which is probably why Dean didn't release an upgraded version for that one. Edited by jsowens, 14 March 2019 - 05:43 PM. Fantastic video Joe, really good and your images too!